The refreshed store is more mod­ern in look and feel with all new fittings, product gondolas and floor to ceiling wall bays and has given the arrival area the added brightness and colour for visitors. 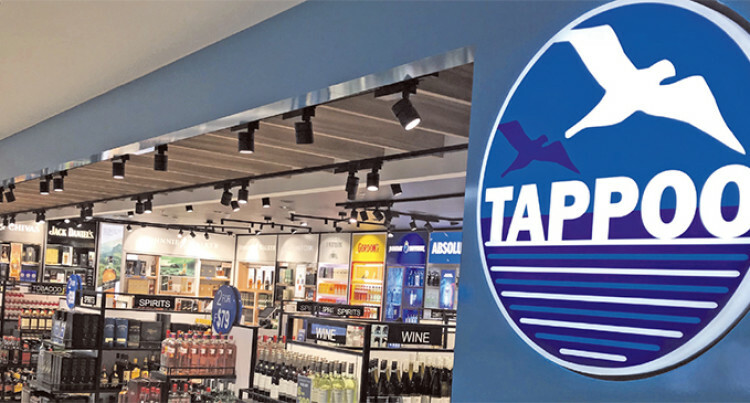 The Tappoo Group of Compa­nies has unveiled its million dollar upgrade of their Nadi International Airport Arrivals Duty Free Store. It offers a wider range of aged and premium spirits from brands like from Johnnie Walker, Jack Daniel’s and Bombay Sapphire (to name a few) as well as chocolates and confectionary for arriving passengers to choose from. The spacious new design allows arriving passengers in a rush to quickly grab their favourite spirits and go while also giving those with more time the space to browse in peace. This has been achieved by mov­ing the point of sales counters to the back of the store while giv­ing greater visibility to premium products and brands on arrival. Tappoo also collaborated with the international brands they stock to design the floor-to-ceiling wall bays, which now carry a wid­er range of products. The fit-outs were carried out by multi-award winning Kingsmen Projects, who manufactured the wall bays in Singapore and assem­bled them onsite in Fiji. “This timely upgrade under­lines the Tappoo Group’s ongoing commitment to Fiji via strategic investments in key economic sec­tors such as tourism,” said Tap­poo Group executive director Kaushal Tappoo. “It builds on the success the group has had with its Nadi Air­port Departures Store. “Last year, Tappoo’s duty-free arm was shortlisted for three awards at the “Oscars of the trav­el-retail industry”. Tappoo Duty Free was a final­ist for Airport Retailer of the Year, Speciality Concept of the Year (for its partnership with Fiji Rugby) and Best Food & Beverage Partnership of the Year (for its Bula Bar & Bistro outlet at Nadi Airport) at the 34th Annual Fron­tier Awards. Tappoo is widely regarded as one of Fiji’s most trusted mark. The Tappoo Group of Companies has grown from a legacy retail brand with over 75 years of his­tory and national presence into one of Fiji’s largest companies with over 1700 employees and di­verse business interests spanning a number of sectors.